I DON’T KNOW HOW MANY OF YOU KNOW ANYTHING ABOUT THE “NESARA” PROGRAM, BUT IT IS SOMETHING I HAVE KNOWN ABOUT AND STUDIED FOR OVER 4 YEARS NOW AND IT NEEDS TO BE IMPLEMENTED FOR THE BENEFIT OF OUR ENTIRE COUNTRY AND EACH ONE OF US. > I HAVE TALKED TO SOME OF YOU IN THE PAST WHO DON’T BELIEVE IT WILL EVER HAPPEN OR DOES NOT EXIST, BUT IT DOES AND IF YOU ALL WOULD DO YOUR HOME WORK ON THIS AS I HAVE DONE, YOU WILL KNOW THAT NOT ONLY IS IT FOR REAL, BUT IT WILL BE IMPLEMENTED THIS YEAR STARTING AS EARLY AS LATER THIS MONTH. > THE POINT IS, YOU WILL ALL BENEFIT AS IT ELIMINATES THE IRS, THE FEDERAL (ILLEGAL) RESERVE AND INCORPORATES BOTH INTO THE U. S. TREASURY DEPARTMENT. THERE WILL BE NO MORE FEDERAL INCOME TAXES, WHICH HAVE ALWAYS BEEN ILLEGAL TO BEGIN WITH AND WE WILL ALL PAY A 14% NATIONAL SALES TAX OR (FAIR TAX). > SO, TAKE THE TIME NECESSARY TO READ THIS ENTIRE POST BELOW, SO YOU WILL UNDERSTAND WHY IT HAS NOT BEEN PUT INTO EFFECT MANY YEARS AGO WHEN IT WAS SUPPOSED TO BE. > IN SHORT, ANSWER TO THAT IS OUR CORRUPT GOVERNMENT AND THOSE WITHIN. WELL, THIS IS ALL COMING TO A CLOSE AND THOSE IN POWER SOON WON’T BE AND A NEW GOVERNMENT WILL BE IN PLACE AND ANNOUNCEMENTS WILL START LATER THIS MONTH RIGHT ON INTO SEPTEMBER. THAT IS WHAT WE ARE BEING TOLD. FINALLY JUSTICE IS COMING OUR WAY. > IN ADDITION TO WHAT IS POSTED BELOW, FOR THOSE OF YOU WHO DO NOT BELIEVE IN BEINGS FROM OTHER WORLDS, OR PLANETS, YOU WILL ALSO HAVE ANNOUNCEMENTS OF THE REALITY OF THEIR EXISTENCE AND THE FACT THAT WE HAVE HAD A SECRET SPACE PROGRAM FOR YEARS AND YOU WILL FINALLY GET THE REAL TRUTH OF THIS ALL. IF YOU DON’T BELIEVE THIS, JUST GO TO THE HISTORY CHANNEL AND WATCH PROGRAMS SUCH AS: “HANGER ONE”, “ANCIENT ALIENS”, “CLOSE ENCOUNTERS”. IF YOU DO, YOU WILL BE BELIEVERS. AS I SAID, THE PLAN IS FOR EXPOSURE TO ALL OF THIS STARTING VERY SOON. AGAIN, JUST TAKE THE TIME TO READ THE REPORT BELOW IN ITS’ ENTIRETY. > Information is added as it becomes known, along with the date it is included. > NOTE: Writing a history of NESARA requires locating the separate dots and attempting to put them together to create truth. The original documents are sequestered and those individuals directly involved are still under a strict gag order. I have used as my foundation a history written by James Rink. My research set out to prove NESARA by locating original documents and articles written by reputable people that illustrated each of the tenets. I have inserted some of these URLs for these tenets into Rink’s history. In my 7+ years of research, I have found nothing to disprove the existence of the NESARA LAW. The internet is loaded with disinformation that can be easily dismissed by research. > As you read this history, you will find mention of high officials being cloned. The capacity to clone an adult individual signifies just one of the many secrets withheld from the public. As “all that is hidden is revealed,” this fact will be confirmed. Cloning of an adult individual is used for various reasons by those working behind the scenes–one example will become known at the divine right moment–the cloning of Princess Diane to avoid her death. Another example is to clone a public figure to prevent public reaction to he/she being removed from their position, as occurred with Janet Reno ( info. added 2014). > Now that information regarding the government/military cover-up of the extraterrestrial presence is in the public domain, we can see parallels of the facets regarding NESARA that many have used to discredit it. Some of these are: deliberate cover-up of information, government/military gag orders, the suspicious death of persons who attempted to tell the truth, control of the media, and the ruining of individual lives and professions. > I encourage all to do your own research and add to the pool of documented evidence on the truth of NESARA. > 1907-1917 – In order to warn Americans, the 1892 Bankers’ Manifesto was revealed by US Congressman Charles A. Lindbergh, Sr. from Minnesota before the US Congress sometime during his term of office between the years of 1907 and 1917. > 1910 – John E. DiNardo, professor of public policy and economics at the University of Michigan, writes in his article “The Federal Reserve Act”: “On the night of November 22, 1910, a small group of surrogates of the most powerful bankers of the World met … under the veil of utmost secrecy. > 1970s – The Federal Land Bank illegally foreclosed on farmers mortgages all throughout the Midwest. In each of these cases the farmers were defrauded by the banks with the approval of the Federal Reserve System. These court cases would eventually become known as the Farmer Claims Program. > 1978 – An elderly ranch farmer in Colorado purchased a farm with loan from the Federal Land Bank. After he died the property was passed on to his son Roy Schwasinger, Jr., who was a retired military general. Soon after a Federal Land Bank officer and Federal Marshall appeared on his property and informed him the bank was foreclosing on his farm, ordering him to vacate within 30 days. Without his knowledge, his deceased father had signed a stipulation which reverted the property back to the Federal Land Bank in the event of the borrower’s death. > Outraged, Roy E. Schwasinger, Jr. filed a class action lawsuit in the Denver Federal Court system. The suit was dismissed on the basis of incorrect filing. This prompted Roy Schwasinger’s investigation into the inner workings of the banking system.
. 1982 – Roy Schwasinger was given a contract by the US senate and later Supreme Court to investigate banking fraud. But because he was under a strict non-disclosure order he was not allowed to tell the media what he discovered. In the late 80’s he began sharing his knowledge with others including high ranking military personnel who helped him bring about a class action lawsuit against the federal government.
. The first series of these lawsuits began in the mid 1980’s when William and Shirley Baskerville of Fort Collins, Colorado were involved in a bankruptcy case with First Interstate Bank of Fort Collins; who was trying to foreclose on their farm. At a restaurant their lawyer informed them that he would no longer be able to help them and walked-off. Overhearing the conversation Roy Schwasinger offered his advice on how to appeal the case in bankruptcy court. So in 1987 they filed an appeal (Case No. 87-C-716) with the United States District Court in Colorado. > 1988 – On November 3, 1988, the Denver Federal Court system ruled that indeed the banks had defrauded the Baskervilles and proceeded to reverse its bankruptcy decision.But when the foreclosed property was not returned they filed a new lawsuit. Eventually, 23 other farmers, ranchers, and Indians swindled by the banks in the same manner would join in the case. > In these cases, the banks were foreclosing on the properties using fraudulent methods such as charging exorbitant interest, illegal foreclosure, or by not crediting mortgage payments to their account as they should have but instead would steal the mortgage payments for themselves triggering foreclosure on the property. > The District Court ruled in their favor and ordered the banks to return the stolen properties with help from either Federal Marshals or the National Guard. But when no payments were made, the farmers declared involuntary Chapter Seven Bankruptcy against the Federal Land Bank and the Farmers Credit System. The banks appealed their case insisting they were not a business but a federal agency therefore they were not liable to pay the damages. > So the farmer’s legal team adopted a new strategy. According to the Federal Land Bank’s 1933 charter they are not allowed to make loans directly to applicants, but instead could only back loans as a guarantor in case of default. Because the Federal Land Bank had violated this rule the farmer’s legal team was able to successfully sue the bank for damages. > Word of the lawsuit began to spread; the legal team would teach others how to fight foreclosure and to help them file lawsuits as well (Case No. 93-1308-M). Celebrities such as Willie Nelson joined in the cause and helped raise money during his “Farm Aid” concerts. > The Baskerville case had now become the Farmer Claims Class Action Lawsuit. Worried about the legal ramifications the government retaliated against the farmers by hitting them with either outrageous IRS fees, or by imprisoning the legal team under frivolous non-related charges. When the farmers realized they were being unfairly targeted, they had military generals such as General Roy Schwasinger sit in the courtroom to make sure the bribed judges would vote according to constitutional law. > The farmers now with a large team of knowledgeable people of the law behind them filed a new case to claim additional damages from the fraudulent loaning activities of the Farmers Credit System. > The government tried to settle but they had already lost many cases and were now loosing the appeals as well. More and more evidence was collected. According to the National Banking Act all banks are required to register their charters with the Federal and State Bureau of Records, but none of the banks complied, allowing the legal team to sue the Farmers Credit System. Not only was Farmers Credit System not chartered to do business with the American Banking Association, but so were other quasi government organizations such as the Federal Housing Administration, The Department of Housing and Urban Development, and even the Federal Reserve Bank. > 1990s – In the early 1990’s Roy Schwasinger brought the case before the United States Supreme Court. Some of the content of this case is sealed from public eyes but most of it can be viewed today. > That the income tax amendment was only ratified by four states and therefore was not a legal amendment, that the IRS code was not enacted into “Positive Law” within the Code of Federal Regulations. Positive Law = Laws that have been enacted by a properly instituted and recognized branch of the government. > That the U.S. government illegally foreclosed on farmer’s homes with help from federal agencies. Irrefutable proof was presented by a retired CIA agent. He provided testimony and records of the banks illegal activities as further evidence that the Farmers’ Union claims were indeed legitimate. The implications of such a decision were profound. All gold, silver, and property titles, taken by the Federal Reserve and IRS must be returned to the people. > The legal team sought assistance from a small group of benevolent visionaries, consisting of politicians, military generals, and business people who have been secretly working to restore the constitution since the mid 1950’s. Somehow within their ranks, a four star U.S. army general received “title” and “receiver” of the original 1933 United States Bankruptcy. When the case was brought before the U.S. Supreme Court, they ruled in his favor, giving the Army General title over the United States, Inc. Legal action was then passed on to the Senate Finance Committee and Senator Sam Nunn, who was working with Roy Schwasinger. > 1991 – With the help of covert congressional and political pressure, President George H.W. Bush issued an Executive Order on Oct. 23, 1991, which provided a provision allowing anyone who has a claim against the federal government to receive payment as long as it’s within the rules of the original format of the case. You may read Executive Order No. 12778 at the URL below. > According to the Federal Reserve Act of 1913, all present and succeeding debts against the U.S. Treasury must be assumed by the Federal Reserve. Thus the farmer’s claims legal team was able to use that executive order to not only force the Federal Reserve to pay out damages in a gold backed currency but also allow them to receive legal ownership over the bankruptcy of United States, Inc.
> To collect damages the farmers legal team used an obscure attachment to the 14th amendment which most people are not aware of. After the civil war the government allowed citizens to claim a payment on anyone who suffered damages as a result of the Federal Government failing to protect its citizens from harm or damages by a foreign government. > President Grant had this attachment sealed from public eyes but somehow, someone on the farmer’s legal team got a hold of it. > Remember this goes back to the Organic Act of 1871 and the Trading with the Enemies Act of 1933, which defined all citizens as enemy combatants under the federal system known as the United States. The Justices and farmer’s legal team recognized how evil and corrupt our federal government had become and to counteract this they added some provisions in the settlement to bring the government back under control. > a. First they would have to be paid using a lawful currency, backed by gold and silver as the constitution dictates. This would eliminate inflation and gyrating economic cycles created by the Federal Reserve System. See Article 1, Section 10 of the US Constitution. c. Lastly the IRS would have to be dismantled and replaced with a national sales tax. This is the basis of the NESARA Law. When the legal team finally settled on a figure, each individual would receive an average of $20 million dollars payout per claim. Multiplied by a total of 336,000 claims that were filed against the U.S. Federal Government, the total payout would come out to a staggering $6.6 trillion dollars. > The U.S. Supreme Court placed a gag order on the case, struck all information from the Federal Registry, and placed all records in the Supreme Court files.Up to that point Senator Sam Nunn had kept the Baskerville Case records within his office. A settlement was agreed to out of court and the decision was sealed by Janet Reno. Because the case was sealed, claimants are not allowed to share court documents to media outlets without violating the settlement, but they can still tell others about the lawsuit. This is why you probably have not heard about this. > 1991 – Roy Schwasinger went before a senate committee to present evidence of the banks and governments criminal activity. He informed them how the Corporation of the United States was tied to the establishment of a New World Order which would bring about a fascist one world government ruled by the international bankers. > 1992 – A task force was put together consisting of over 300 retired and 35 active US military officers who strongly supported constitutional law. * This task force was responsible for investigating governmental officials, congressional officers, judges, and the Federal Reserve. The Federal Reserve was accustomed to giving orders to politicians and had no intentions of being audited. However after they were informed their offices would be raided under military gunpoint if necessary; they complied with the investigation. > After reviewing their files the military officers found $800 trillion dollars sitting in accounts which should have been applied to the national debt. And contrary to federal government propaganda they also discovered that most nations had in fact owed money to the United States instead of the other way around. > Despite these death blows President George H.W. Bush and the illuminati continued on with their plans of global enslavement. > 1992 – In August 1992 the military officers confronted President Bush and demanded he sign agreement that he would return the United States to constitutional law and ordered him to never use the term New World Order again. Bush pretended to cooperate but secretly planned to bring about the New World Order anyway by signing an Executive Order on December 25, 1992, that would have indefinitely closed all banks giving Bush an excuse to declare martial law. > Under the chaos of martial law, Bush intended to install a new constitution which would have kept everyone currently in office in their same position for 25 years and it would have removed all rights to elect new officials. The military intervened and stopped Bush from signing that Executive order. > 1993 – In 1993 members of the Supreme Court, certain members of congress and representatives from the Clinton government meet with high ranking US military officers who were demanding a return to constitutional law, reforms of the banking system, and financial redress. They agreed to create the farm claims process which would allow the legal team to set up meetings all over the country on a grass roots level to help others file claims and to educate them about the lawsuit. > A claim of harm could be made on any loan issued by a financial institution for all interest paid; foreclosures; attorney and court fees; IRS taxes or liens; real estate and property taxes; mental and emotional stress caused by the loss of property; stress related illness such as suicide and divorce; and even warrants, incarceration, and probation could also be claimed. > 1994 – But the Clinton government undermined their efforts by requiring the farm claims to use a specific form designed by the government. This form imposed an administrative fee of $300 for each claim, which was later used in 1994 as a basis to arrest the leaders of the legal team including Roy Schwasinger. > The government was so afraid of what they would say during their trial in Michigan that extra steps were taken to conceal the true nature of the case. County courthouse employees were not allowed to work between Monday and Thursday during the course of the trial. And outside the courthouse, FBI agents swarmed the perimeter preventing the media and visitors from learning what was going on as well. > During the first Clinton administration the military delayed many of Clinton’s federal appointments until they were sure these individuals would help restore constitutional law. One such individual who promised to bring about the necessary changes was Attorney General Janet Reno. > 1993 – In agreement with the Supreme Court ruling on June 3, 1993, Janet Reno ordered the Delta Force and Navy Seals to Switzerland, England, and Israel to recapture trillions of dollars of gold stolen by the Federal Reserve System from the strategic gold reserves. These nations cooperated with the raid because they were promised their debts owed to the United States would be canceled and because the people who stole the money from the United States also stole money from their nations as well. > This bullion is to be used for the new currency backed by precious metals. It’s now safely stockpiled at the Norad Complex at Colorado Springs, Colorado and four other repositories. Janet Reno’s action so enraged the powers-that-be, that it resulted in her death. She was then replaced with a clone and it was this creature that was responsible for covering-up the various Clinton scandals. > To keep the Secretary of the U.S. Treasury Robert Rubin in line, he too was also cloned.For the remainder of their term in office both Reno and Rubin received their salaries from the International Monetary Fund as foreign agents and not from the U.S. Treasury. Despite these actions the legal team continued on with their fight while managing to avoid bloodshed and a major revolution. > After 1993 the farmer claims process name was changed to Bank Claims.Between 1993 and 1996, the U.S. Supreme Court required U.S. citizens to file “Bank Claims” to collect damages paid by the U.S. Treasury Department. This process CLOSED in 1996. > During this time the U.S. Supreme Court assigned one or more Justices to monitor the progress of the rulings. They enlisted help of experts in economics, monetary systems, banking, constitutional government and law, and many other related areas. These justices built coalitions of support and assistance with thousands of people worldwide; known as “White Knights.” The term ‘White Knights’ was borrowed from the world of big business. It refers to a vulnerable company that is rescued from a hostile takeover by a corporation or a wealthy person—a White Knight. > To implement the required changes, the five Justices spent years negotiating how the reformations would occur. Eventually they settled on certain agreements, also known as Accords, with the U.S. government, the Federal Reserve Bank owners, the International Monetary Fund, the World Bank, and with numerous other countries including the United Kingdom and countries of the Euro Zone. > Because these U.S. banking reformations will impact the entire world; the IMF, World Bank, and other countries had to be involved. The reformations require that the Federal Reserve be absorbed by the U.S. Treasury Department and the banks’ fraudulent activities must be stopped and payment must be made for past harm. > 1998 – The military generals who originally participated in the farmer’s claim process realized that the US Supreme Court justices had no intentions of implementing the Accords. So they decided the only way to implement the reformations was through a law passed by congress. > 1999 – A 75 page document known as the National Economic Security and Reformation Act (NESARA) was submitted to congress where it sat with little action for almost a year. > 2000 – Late one evening on March 9, 2000, a written quorum call was hand-delivered by Delta Force and Navy SEALS to 15 members of the US Senate and the US House who were sponsors and co-sponsors of NESARA. They were immediately escorted by the Delta Force and Navy SEALS to their respective voting chambers where they passed the National Economic Security and Reformation Act. President Clinton signed the Act into LAW. > These 15 members of congress were the only people lawfully allowed to hold office in accordance with the original 13th amendment. Remember British soldiers destroyed copies of the Titles of Nobility Amendment (TONA) in the war of 1812 because it prevented anyone who had ties to the crown of England from holding public office. President Clinton relinquished his bar registry. > NESARA is the most ground breaking reformation to sweep not only this country but our planet in its entire history. The act does away with the Federal Reserve Bank, the IRS, the shadow government, and much more. 19. Enables the release of over 6,000 patents of suppressed technologies that are being withheld from the public under the guise of national security, including free energy devices, anti-gravity, and sonic healing machines. > October 10, 2000 – Because President Clinton’s clone had no interest in signing NESARA into law on October 10, 2000; under orders from U.S. military generals, the elite Naval Seals and Delta Force stormed the White House and under gunpoint forced Bill Clinton to sign NESARA. During this time Secret Service and White House security personnel were ordered to stand down, disarmed, and allowed to witness this event under a gag order. > From its very inception Bush Sr., the corporate government, major bank houses, and the Carlyle group have opposed NESARA. To maintain secrecy, the case details and the docket number were sealed and revised within the official congressional registry, to reflect a commemorative coin and then again it was revised even more recently. This is why there are no public Congressional Records and why a search for this law will not yield the correct details until after the reformations are made public. > Members of congress will not reveal NESARA because they have been ordered by the U.S. Supreme Court Justices to deny its existence or face charges of treason punishable by death. Some members of Congress have actually been charged with obstruction. When Minnesota Senator Paul Wellstone was about to break the gag order, his small passenger plane crashed killing his wife, daughter, and himself. > If fear isn’t enough to keep Washington in line, money is. Routine bribes are offered to governmental/military officials by the power elite/secret government. > Not surprisingly, much disinformation about NESARA can be found on the internet. Wikipedia’s article is total disinformation. Dr. Harvey Francis Barnard’s NESARA bill—National Economic Stabilization and Recovery Act was rejected by congress in the 1990’s. > Dr. Barnard was a systems philosopher and had tried for years to interest Congress in his monetary reform suggestions. A testimony by Dr. Barnard’s close friend, Darrell Anderson, may be read at:http://www.simpleliberty.org/bookshelf/draining_the_swamp.htm You may also read articles by Darrell Anderson at this site. Both men were interested in monetary reform. > September 11, 2001 – The next step is to announce NESARA to the world, but it’s not an easy task. 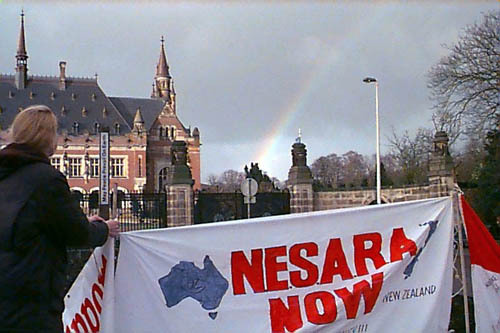 Many powerful groups have tried to prevent the implementation of NESARA. > The NESARA law requires that at least once a year, an effort be made to announce the law to the public. Three then current US Supreme Court judges control the committee in charge of NESARA’s announcement. These Judges have used their overall authority to secretly sabotage NESARA’s announcement. > In 2001 after much negotiation the Supreme Court justices ordered the 107th Congress to pass resolutions approving‘ NESARA. This took place on September 9, 2001, eighteen months after NESARA became law. On September 10, 2001, George Bush Sr. moved into the White house to steer his son on how to block the announcement. The next day, on September 11, 2001, at 10 AM Eastern Daylight Time, Alan Greenspan was scheduled to announce the new US Treasury Bank system, debt forgiveness for all U.S. citizens, and abolishment of the IRS as the first part of the public announcements of NESARA. > Just before the announcement at 9 am, Bush Sr. ordered the demolition of the World Trade Center’s Twin Towers to stop the international banking computers on Floors 1and 2 in the North Tower from initiating the new U.S. Treasury Bank system. Explosives in the World Trade Center were planted by operatives and detonated remotely in Building 7, which was demolished later that day in order to cover-up their crime. > Remote pilot technology was used in a flyover event to deliver a payload of explosives into the Pentagon at the exact location of the White Knights in their new Naval Command Center who were coordinating activities supporting NESARA’s implementation nationwide. With the announcement of NESARA stopped dead in its tracks, George Bush Sr. decapitated any hopes of returning the government back to the people. > For the past 10 years, life in the USA, and numerous other countries, has been dictated by the staged terrorist’ attack and its repercussions. Seldom does a day go by that we do not hear mention of 9/11. > 2005 – Dr. Harvey F. Barnard died on May 18, 2005. > 2011 – The Debt Ceiling debacle kindled re-newed interest in NESARA. As we watch the world economy collapse, we can know that the NESARA LAW remains in the background, ready to be announced.